While all of the colleges had Wi-Fi access technology in place, the ICT departments have seen a huge year-on-year growth in mobile device related traffic, driven by students using an increasing number of devices, such as tablets and smartphones, to access lecture material as well as for personal use. For both universities, conducting the best international research is still a primary goal, and having a network which enables this to be found, shared and downloaded is essential in keeping the institutions at the forefront of this industry. 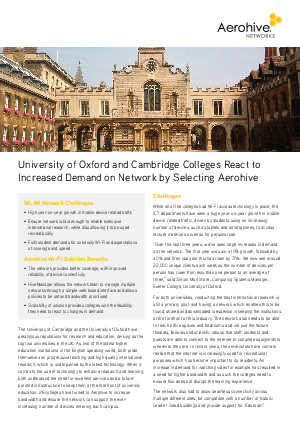 Download now to find out how Aerohive Wi-Fi Solutions provides maximum coverage to enable staff and students to use the network for both academic and recreational purposes.